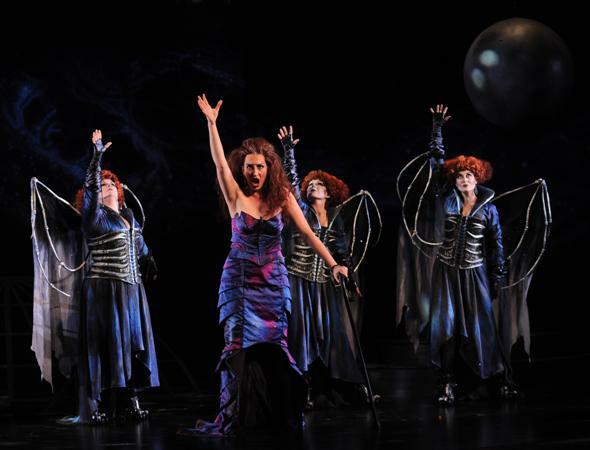 The Chicago Opera Theater production of Mozart’s “The Magic Flute” leaves one with two distinct impressions. For the most part, its young cast sings with stylistic savvy, fetching beauty and engaging spirit – all shaped with unfailing sensibility by conductor Steuart Bedford. But if one measures this “Magic Flute” as the theatrical enterprise it ultimately must be, the parts do not add up to a very large sum. Its minimal staging seems less a statement of artistic choice than a shrugging confession of budgetary constraint. Vocally, there is much to relish — from the splendid match-up of tenor Sean Panikkar’s Prince Tamino and soprano Elizabeth Reiter’s Pamina to soprano Emily Hindrichs’ spectacular Queen of the Night. As a late replacement for Irish soprano Claudia Boyle, who got tripped up by visa issues, Hindrichs brought down the house with the Queen’s two famously difficult arias. With one foot in the tradition of comic opera and the other planted on the border between vaudeville and what eventually became musical comedy, “The Magic Flute” offers an intriguing hodge-podge of romance, farce and philosophy. The mysterious Queen of the Night enlists the handsome young prince Tamino to rescue her daughter Pamina from the clutches of Sarastro, high priest of an enlightenment brotherhood. 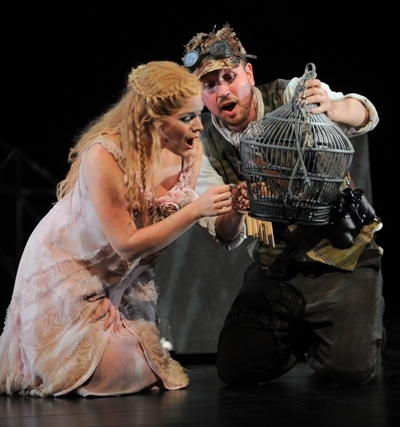 The “star-blazing” Queen also requires the hair-brained bird-catcher Papageno to accompany Tamino on his adventure. 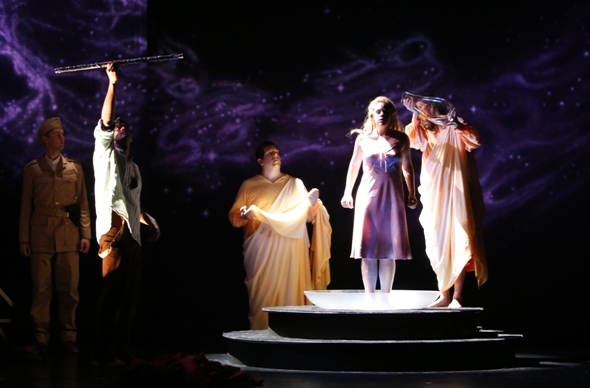 Their main defense against Sarastro’s might is a magic flute and a set of enchanting bells. Of course, Sarastro turns out to be not merely a good guy but a wise and spiritual man who sees in Pamina and Tamino the stuff of his successors. Papageno, on the other hand, never evolves much beyond the satisfactions of wine and women. “The Magic Flute” was composed to a German text. American productions are often sung in English, though not usually to so imaginative and cleverly rhymed a translation as Chicago Opera Theater offers in this version by Jeremy Sams. Mozart and librettist Emanuel Schikaneder would have expected lots of laughter, and indeed merriment rules here. It’s a night of terrific singing, too. 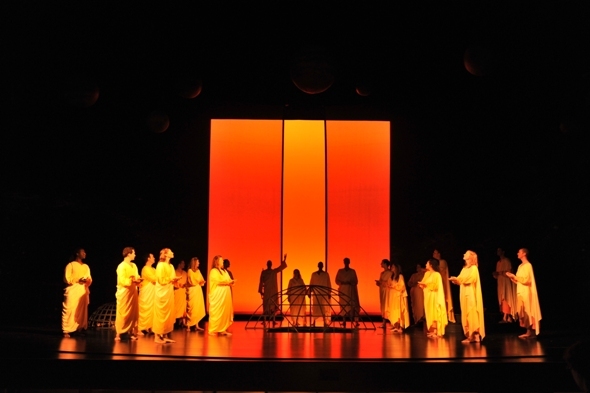 Panikkar invests Tamino’s arias with a disarming blend of sweetness, strength and pliancy. This tenor is a commanding prince. Likewise, Reiter’s sensitive and yearning Pamina takes life from vocal lines that fairly float; but she can also summon real power when those moments come. As Sarastro, bass Grigory Soloviov cuts an imposing figure physically and delivers a solidly rooted sound to match. Opposite that sublime image – and music – stands (or perhaps trembles) the feckless bird-catcher Papageno, one of Mozart’s most beloved roles. Baritone Markus Beam feathers it with enthusiasm, a dry wit and expressive voice. Not so gratifying is Alex Monsoori’s turn as Monostatos, the lecherous captain of Sarastro’s guard. Apart from his sunglasses, there’s nothing especially intimidating about this evil man’s attire, and director Michael Gieleta – who generally connects his players with efficiency and purpose – doesn’t seem to know what to do with him. One of the opera’s funniest episodes, when Papageno’s invokes his magic bells to freeze the palace guards just as he and Pamina are about to be seized, is squandered here in a flourish of indifference. This brings us to a litany of shortcomings in the stage productions, though I’ll be selective and brief. Is that fluffy length of rope draped about Tamino at the outset meant for the dragon that, even dead, scares the daylights out of Papageno? Perhaps clever lighting and some use of projections might have done the trick more effectively and yet economically. I’m not sure what all those hanging orbs are meant to signify – planets, I surmise. But why? And where’s the rope with which Papageno proposes to end his solitary life? (Here he contemplates a plunge into an open trap door, a far less grim prospect than hanging.) And while unit sets can serve many environs, this meager backdrop of a swirling night sky is less do-all than make-do. What a joy it was to see the night sky part, at the end, to reveal a brilliant aspect of yellow and orange. Oh, yes, at the opera’s close, when one might expect Tamino and Pamina to be translated into some posture of their new dominion, Gieleta strands them with nothing to do but shake hands all around as the music winds down. Gregory Gale’s costumes, excepting the guard’s Mayberry beige uniforms, add much needed color and flavor. Kudos as well to the Queen’s three ladies – Leila Bowie, Julia Hardin and Katherine McGookey – for their consistently fine singing, and to Chicago Opera’s well-prepared orchestra. The crisp, buoyant Overture promised good things to come from the orchestra, which did not disappoint.